Custom die-cut business cards are a hit with businesses selling perfumes, shoes, art supplies, clothes, and more. If you want to set yourself apart from your competitors, a die-cut business card is a good option to show your creative site. If you have creative flair, you can show it through die-cut business cards. We have both complex and basic shapes available. You can look through our comprehensive collection of templates to select a shape that best describes your company. 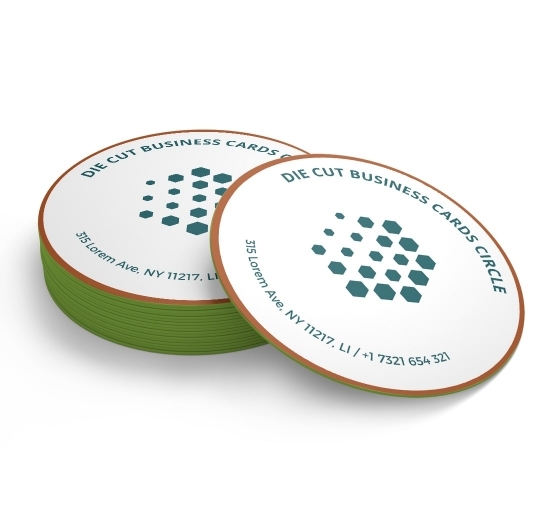 Custom die-cut business cards also increase the chance of people taking your business card without you having to hand it out. The unique shape will intrigue and they will be compelled to pick it to take a closer look. Of course, they will not put it back in the tray, but will take with them. The entire reason businesses even invest in a die-cut business card is to separate themselves from the competition. Most of your competitors will have a rectangle-shaped business card design. If you are giving out several business cards at an event, which one do you think will stick out? - Yours! When your customer places all of the business cards they have received over the years, which one do you think will look different? - Yours! Which one will they be likely to keep? - Yours! That's why, you need to invest in odd and fun shaped business cards, not boring and dull. At BannerBuzz, get started on your custom business card printing and design!